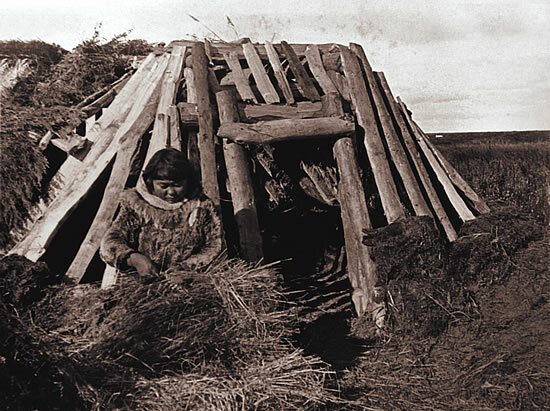 A woman prepares grass mats to cover a house frame. Pieces of sod were then placed on top, creating a warm, well-insulated home. 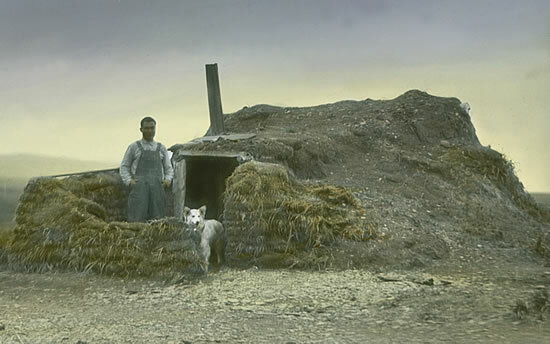 A man stands behind the sod windbreak built to protect the entryway to this house. The stovepipe is a "modern" addition. Uksumi pilliniunga ellangarcama piunga, paluqtam enekngalkiini enemi uitallinilrianga. Perhaps it was in winter when I suddenly became aware, I looked around and saw I was inside a house that resembled a beaver house. Naklegnarqessaaqellrulliniukut tamatum nalliini. Aling, arrsaucirput nalluluku. Ukut wani tungayakelriit tua-i atauciq nek'ellruamegteggu, tua-i kassuggluku yungqerraqluni ena. I realize now that we were actually pitiful back in those days. Gosh, we didn't even know that we were poor. The whole extended family lived in one house, occupying every inch.